With the release of Captain America: Civil War less than two weeks off, Phase 3 of the Marvel Cinematic Universe is about to shift into overdrive. It may be a long time before Captain Marvel sees action in 2019, but is it possible that Marvel’s already got the perfect lead actress and director in mind? During this week’s episode of Meet The Movie Press, The Wrap’s Jeff Sneider had some interesting insight into the forthcoming Captain Marvel flick. Although cryptic, Sneider did offer up a curious possibility. If there’s truth to the rumor, it would seem the actress and director share the same first name. 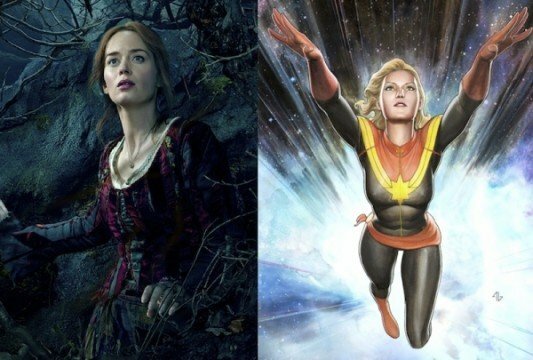 So far, there have been a number of actresses associated with the Captain Marvel role. List toppers include Charlize Theron, Rebecca Ferguson and Brie Larson. In particular, Emily Blunt has been heavily connected with the role. Depending on how accurate the rumor is, it’s entirely possible Emily Blunt is Marvel’s top choice for the role. But who would direct Captain Marvel? CBM has a few suggestions, such as British director Emily Young (Veronika Decides to Die), Emily Ting (Already Tomorrow In Hong Kong), web-animator and short film director Emily Carmichael (Penny Arcade), or filmmaker wunderkind Emily Hagins (Pathogen). Of course, there are several working directors with the name Rebecca as well, including Rebecca Thomas (Las Vegas, West) and Rebecca Johnson (Honeytrap). There is also still an outside chance that Kathryn Bigelow (who’s already slated for pre-production on another film in 2017 – so a very outside chance) and Katheryn Winnick could be the pair. And although Kevin Smith’s dream money is still on Rhonda Rousey, she seems like a distant possibility at best, especially going by the name game rumors. In the long run, Sneider’s words are still nothing but speculation. To be honest, any of the actresses currently in the running for Captain Marvel would make an excellent choice – especially since Marvel usually opts for established leads with charisma (Robert Downey Jr., for instance). Hopefully they’ll reveal what’s up their sleeves before Comic-Con – assuming Feige and Co. are nearing a decision.